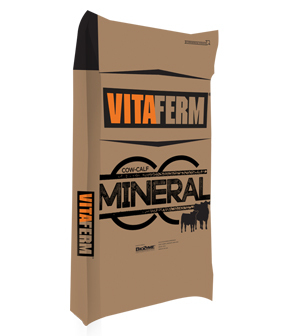 The VitaFerm® Cow-Calf Mineral is an economical vitamin & mineral supplement for beef cattle that supports the health of the cow and her calf. Provides a blend of fortifying nutrients answering the needs of the cow and calf for efficient growth and health. Corn Gluten Feed, Salt, Calcium Carbonate, Monocalcium Phosphate, Dicalcium Phosphate, Wheat Middlings, Magnesium Oxide, Dried Aspergillus oryzae Fermentation Product, Zinc Sulfate, Manganese Sulfate, Copper Sulfate, Sodium Selenite, Ethylenediamine Dihydroiodide, Cobalt Carbonate, Mineral Oil, Potassium Chloride, Vitamin E Supplement, Vitamin A Supplement, Vitamin D-3 Supplement.